Don’t let the name deceive you – you’re no Robin Hood here. 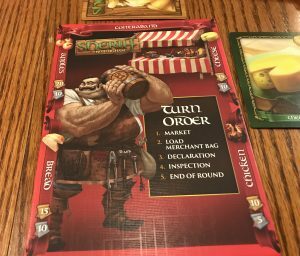 Instead of stealing from the rich to enrich the poor, Sheriff of Nottingham is all about getting rich yourself, all under the eyes of the ever watchful law. Each player is a merchant running a local stand inside the city. To stock your shelves, you have to get goods past the gate. 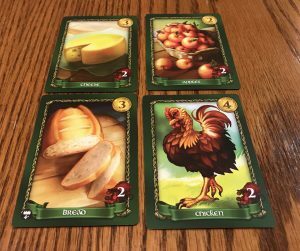 There are two categories of goods: legal (chickens, bread, cheese, and apples) and contraband (silk, mead, crossbows, and pepper). As you might guess, legal goods are allowed inside the city while contraband is not. Players pick cards from their hand to put in their declaration pouch. When the time comes, they’ll declare these goods in an attempt to add more merchandise to their stand. Only one kind of legal good is allowed in the city at a time – of course, don’t let that stop you. In this game, you won’t win by playing by the rules. The sheriff’s job is to make sure everyone else is playing by the rules and players alternate filling the job. Each player takes a turn declaring what is in their declaration pouch and the sheriff can choose to search as many as they want. If caught with contraband cards or undeclared legal cards, players must pay a penalty to the bank and those goods are confiscated. Players also have the option of offering a bribe to the sheriff not to search their pouch, the proceeds of which go into the sheriff’s pocket. If the sheriff falsely accuses someone, that person is compensated with money from the bank. The game ends after every player has taken two turns as the sheriff. Players count up the value of their goods as well as the money in their personal stash. Additional money is awarded to those with the most of each legal category. The one who made the most money wins! This game creates fun interactions between players. It’s amusing to see someone try and slip past with a lie or, even better, to boldly try to bribe the sheriff. The more people you have the better, as it creates more amusing interactions. It’s simple to learn. It won’t take long for players to pick up how to play this game. This games moves quickly. You don’t have to set aside a lot of time to play this game so, if you only have a short while, this game is a good choice. There’s little incentive for the sheriff not to search people. The penalty that the sheriff has to pay comes from the bank, not their own pocket. Sure, if the sheriff gets it wrong then the accused player gets extra money towards winning, but the penalties are not usually too high. The penalty to a player for lying is greater than the penalty to the sheriff for a false accusation. This game doesn’t play well in back-to-back games. Eventually you pick up who bluffs and who plays it straight. By the end of two rounds, you can often tell when someone is lying. If you break this out for a game night, you’ll probably only play it once per night, so be sure to have some other games on hand as well. This game works best in a casual setting or if you play games with multiple groups of people. If you play it with the same group too often, you’ll figure each other out. However, if that first sentence describes you, this game is good fun. 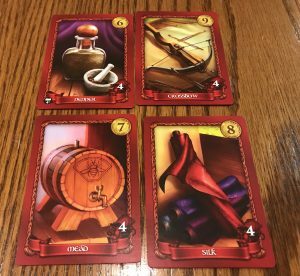 Players shape the experience in Sheriff of Nottingham, so the experiences are as diverse as your play group. This entry was posted in Articles, Board Games, Review and tagged Board Games, Nottingham, Review, Sherriff, Tom. Bookmark the permalink.